Although the Encyclopédie is one of the landmarks of eighteenth-century thought and one of the most famous encyclopedias of all time, most of its collaborators are scarcely known. This is unfair and misleading: the editors, Diderot and d’Alembert, were able directors and prolific contributors, but they needed the help of many others to complete such an ambitious and trying enterprise. 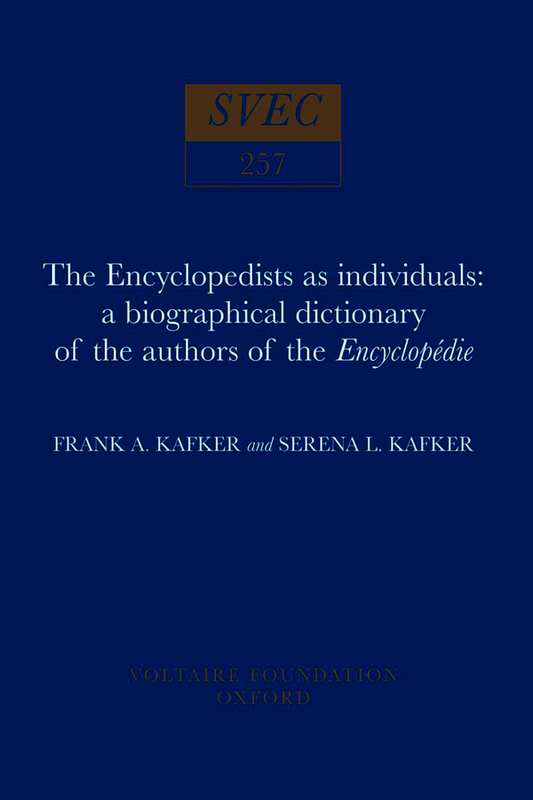 This biological dictionary also seeks to deepen our knowledge of the Encyclopedists. Scholars frequently generalise about the contributors’ social background, politics, religious beliefs, and other matters without being able to speak knowledgeably about many more than a dozen Encyclopedists. But, as we shall see, the Encyclopedists do not lend themselves to stereotypes. They were not a sect of like-minded thinkers, even though contemporaries and later historians believed otherwise. Some of them met at such salons as the baron d’Holbach’s and madame d’Epinay’s or at such learned societies as the Paris Académie royale des sciences or the Académie française; but others did not know each other, and they certainly did not try to co-ordinate policies. Even if they had, they would have failed. These biographical profiles indicate that the Encyclopedists were not united by a common social background, occupation, or ideology. Dissimilarities among the Encyclopedists are not surprising considering how they came to write for the enterprise. At the start, the publishers and their first editor, Jean-Paul de Gua de Malves, recruited people to help them revise and translate Ephraim Chambers’ Cyclopaedia. After Diderot and d’Alembert had assumed the editorship, the work took on a polemical purpose – to reform the Old Regime. But it also remained a general encyclopedia requiring contributors with a knowledge of such non-controversial subjects as the harp, wood engraving, or bridge building. Also, on controversial subjects, the editors accepted contributions that differed from their own opinions. Scholars pursuing research in prosopography, social history, and many facets of the eighteenth century will find something of value in profiles of so many men of letters, clergymen, artisans, physicians, and scientists.